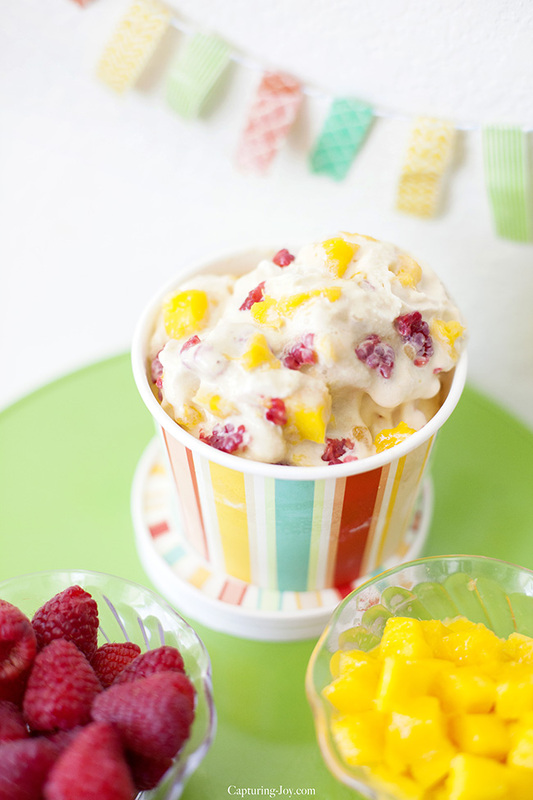 This mango ice cream begins with an irresistibly rich vanilla base, swirled with fresh mango & raspberry fruit, and a mango nectar jam. I’ve declared this the summer of the mango for me. I’m obsessed with eating everything mango, and when I walked into World Market and saw mango nectar and pineapple mango jam, I knew there was some mango ice cream in my future. 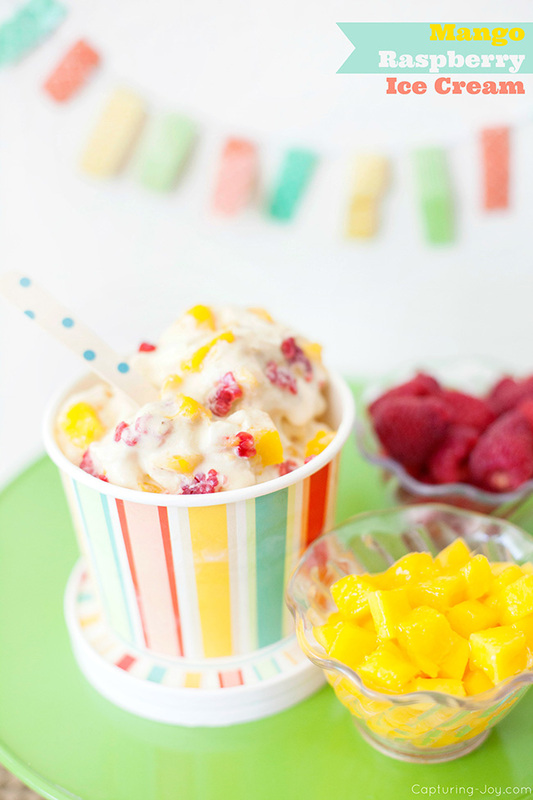 I added fresh mangos and raspberries to the mango ice cream and the rest is history. 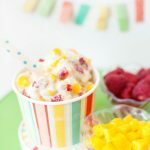 Since it’s the last week of school in our neck of the woods, I thought I’d throw a mini ice cream party with my girls, and make this summery treat. I grabbed the adorable paper ice cream bowls (that also have lids, great for traveling) and mini polka dot wooden spoons that I found in World Market. And I also picked up the individual blue Zoku ice cream maker and Zoku Endless Summer ice cream recipe book. I knew my girls would have lots of fun experimenting with recipes this summer, and there are so many great concoctions, including sorbets. 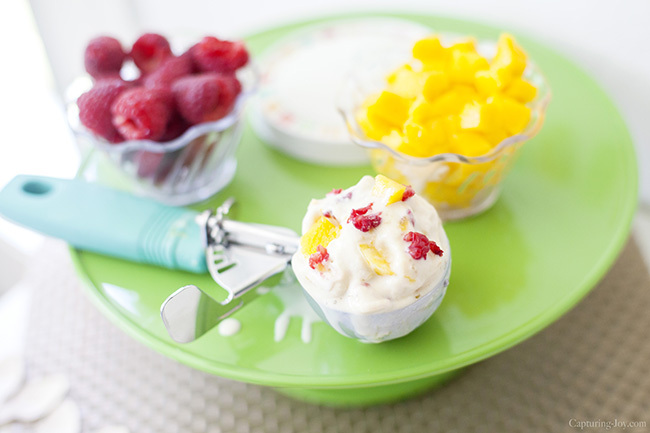 Making the ice cream is a fun activity for kids in the summer, because it’s a process. It takes time. Keeps the kids busy. We all need time fillers, right? The vanilla base is very delicious, too. So you can use it as the start of any delicious ice cream concoction. Whisk together milk, cream, sugar, and vanilla for 3 minutes until sugar is dissolved. Chill mixture 15-20 minutes in freezer. Add mango nectar. Pour 5 oz. liquid into Zoku ice cream maker, and stir and scrape the bowl over and over, while watching the liquid harder before your eyes. Add toppings and jam as desired. 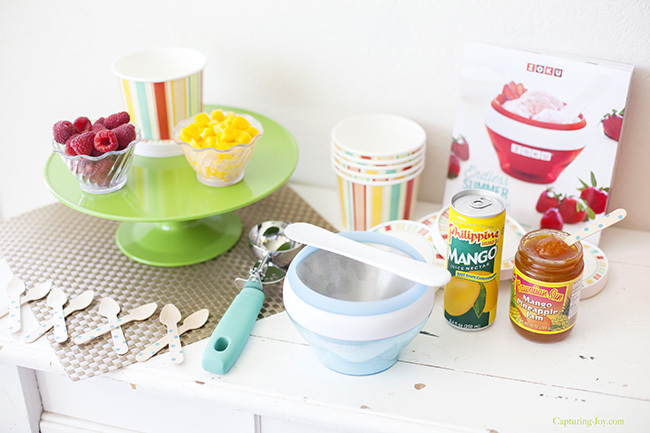 *If using the Zoku ice cream machine, freeze inner bowl overnight. The mango pineapple jam REALLY made the flavor stand out! Below is a picture of the cookbook, and mango items I found at World Market, so it will be easy to locate in the store. I had fun taking pictures of our mini party, too! Have one of your own this summer!